Home Facebook latest social media Does Turkey's Terror Show that Facebook is a Media Outlet After All? 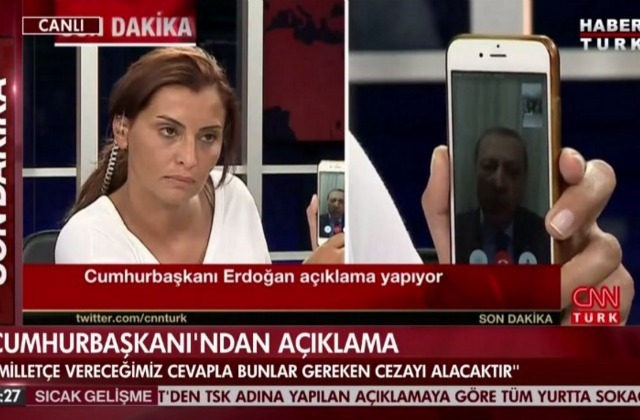 Does Turkey's Terror Show that Facebook is a Media Outlet After All? It took all of five minutes for the French Revolutionaries to fragment and start cutting each other's heads off; all, they said, for liberté, égalité and fraternité. The latter being shorthand for the new nation state, it became quite clear just how easily this new democracy stuff could be jeopardised for the preservation of that greater good. A quarter-millennium later, nobody's really cracked it; and many think a similar type of process is currently being played-out in Turkey where, following a failed military coup in June, 140 journalists have been arrested, 170 media outlets closed and, since November, 125,000 state employees have been purged from government. Over Christmas, however, new evidence seemed to emerge for the development of a strange new phenomenon in the modern world: the shifting of the frontline of the great 'struggle for democracy' to the online sphere. This isn't, of course, the first time a repressive government has clamped-down on the general exchange of information. However, it is interesting to note how often this type of thing seems to happen in relation to social media nowadays. November 2016, for example, saw Cameroonian officials characterise the use of sites like Facebook and Twitter as 'a new form of terrorism...as dangerous as a missile.' A year prior to that, the FBI was criticised for suggesting a re-tweet of terrorist content was terrorism in itself; and last month, as Facebook, Twitter, YouTube and Microsoft announced plans to share data in order to hamper extremism, four of the world's biggest corporations gained the power to censor whatever they choose to define as such. The point is that such circumstances, including the one currently playing-out in Turkey, are comparable, in a way, to the wake of the French revolution. Although Turkey's Terror has emerged from a failure to topple a governmental system, it's nonetheless a process by which a governmental system is said to be couching blatant contradictions of the democratic process in the language of democracy itself. The Turkish state has never claimed to be perfectly democratic. Instead, Erdogan's supporters have always said he's focusing on 'the basics' - using a heavy hand to deal with Turkey's unique challenges and thereby making things better for the majority; which they consider a democratic necessity. But beyond this particular case (and regardless who's right), we can certainly identify a peculiar trend emerging from this example when it's put alongside those mentioned above. In short: a) it's widely believed that great, intra-national struggles for what's generally understood to be 'democratic progress' is being played out in countries all across the world; and b) the sphere within which these ongoing struggles are being held is nowadays moving online. It's no longer just newspapers and conventional media outlets which are being suppressed, controlled and argued over, but specific elements of social media. Interestingly, when we consider what may be driving this change, a combination of factors emerge in a far more complex tapestry than before. One cause, for sure, is the pretty well-understood desire of authorities to curtail the organisational power of social media. However, another less obvious factor may be that governments are increasingly seeing sites like Facebook and Twitter as sources of news, information and the generation of world views: the seeds of dissent, as it were. Consequently, then, we arrive at a strange prospect: because it could further be said that some authorities have gone ahead and redefined such websites as 'media outlets' after all; whilst we're still, ostensibly, bogged-down arguing about it. If that's the case, should we also follow suit? Maybe. Either way, it couldn't hurt to better understand the way in which the powerful think. But perhaps there's a more interesting question: if we consider a scenario in which we were to lose access to social media through, say, a crackdown on its use in Britain, what first springs to mind? Is it the loss of a means to political organisation? Or is it the fact that such a scenario would deprive us of a major source of ideas, opinions and, indeed, news? If it's the latter (and for many it probably is), perhaps we could in fact say that we've redefined social media in our own minds after all... just without realising it.